Two Vancouverites shared their experiences engaging in solidarity work with Palestine at the Unitarian Church on Saturday, December 10, marking International Human Rights Day by exposing the violation of Palestinian human rights and the potential of international struggle to support the Palestinian movement to reclaim those rights. Karen DeVito, recently returned after the Freedom Waves Flotilla to Gaza, when the Canadian boat "Tahrir," on a mission to break the siege of Gaza, was attacked and hijacked by Israeli military commandos, who arrested and deported DeVito and her fellow passengers on the Tahrir, joined John "Max" Soos, a psychologist who took part in the Palestinian olive harvest, confronting settler violence, the Apartheid Wall, and occupation military forces while preserving Palestinian agriculture and heritage. The Canadian Boat to Gaza's Vancouver Committee and the Social Justice Committee of the Unitarian Church sponsored the event, "Running the Blockade and Harvesting the Olives," which opened with a tribute to longtime Vancouver activist Bob Rosen, who had long been active in a multitude of Palestine solidarity and labour activities in the area, and who passed away on November 22, 2011. Dr. John Soos said that he had initially travelled to Palestine as part of a "spiritual journey to the holy land," and while on that journey, learned about the Apartheid Wall, occupation, settlements and colonialism in Palestine. He described the "sacred land" as "scarred and scared," torn apart by Israeli military occupation and the literal scar of the Wall destroying Palestinian land and Palestinian lives. After his initial visit to Palestine, he related, he was determined to return. He returned this autumn, noting that his travel came as "Palestinian civil society has issued a call - like the call for Boycott, Divestment and Sanctions - for international participation in the olive harvest." Soos relayed the sobering statistics of the destruction of olive trees, which are central to Palestinian agriculture and the Palestinian economy, by settler violence and military attacks, noting that in the one month he spent in Palestine, 2600 olive trees were destroyed by settlers, 1500 of them set on fire. The United Nations reported that the same number were destroyed in September; Oxfam has reported that $540,750 in economic damage has been done so far in 2011 as a result of settler attacks on olive trees only. Indeed, since the occupation of the West Bank area of Palestine in 1967, up to 1.2 million olive trees have been destroyed, at an estimated economic toll of $55 million. He went on to note that settler attacks and violence take place with impunity. 91% of settler violence cases are closed with no indictments, while settlers receive military guard as they assault Palestinians and destroy their property. Soos relayed the experience of the village of Al-Walaja; its inhabitants expelled from their homes in Palestine in 1948 in the Nakba by attacking Zionist forces, they fled several kilometers away into the West Bank, behind the 1949 armistice line and rebuilt their village. Two Israeli towns were built over their destroyed village. In 1967, when the entirety of Palestine was occupied, part of the new Al-Walaja was seized and illegally annexed to Israel; 45 houses were destroyed and the presence of Al-Walaja's people in their own land was made illegal. In the 1970s, more of Al-Walaja's land was confiscated to build more illegal Israeli settlements, of Gilo and Har Gilo; in 2004, yet another settlement, Giva't Yael, confiscated yet more of Al-Walaja's land. In 2010, the Israeli occupation announced its plans to completely encircle Al-Walaja with the occupation wall, and has continued its attacks and home demolition, destroying the homes of hundreds and uprooting hundreds of olive trees in the last month alone, threatening the ability of the village to survive, as its agricultural and economic lifelines are threatened to be severed entirely by the occupation forces. Soos spent time in Al-Walaja, Beit Ommar, and other villages in the Bethlehem area, during his time in Palestine in October. He participated in the harvest, as well as the ongoing popular resistance protests against the Wall and the confiscation of Palestinian land. Soos noted, "The settlements are growing and expanding - that's the whole settler colonial Zionist project, forcing out Palestinians." He concluded by discussing the trauma faced by Palestinian children from his perspective as a psychologist, including the massive prevalence of PTSD, noting that in this case "the trauma is not 'post', it is ongoing, it is the new normal." He discussed the cases of Palestinian child political prisoners, noting that over 80% have reported physical violence and torture during their detention. 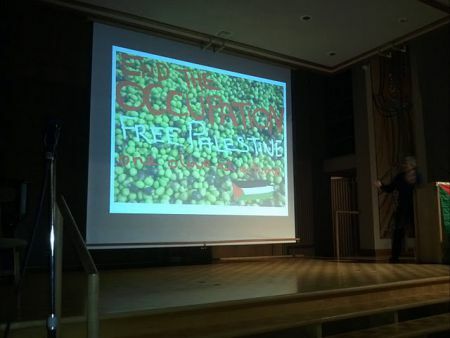 He concluded, encouraging attendees to participate in future olive harvest solidarity activities. Soos' talk was followed by a presentation by Karen DeVito, who began her presentation by recognizing that, as in occupied Palestine, this event also was being held on unceded indigenous land. DeVito reviewed the history of the Tahrir and the Gaza flotilla, from its attempt to sail from Greece in the summer, blocked by the "threats of the IMF and Israel," to the recent Freedom Waves Flotilla, which sailed secretly from Turkey until it reached international waters. 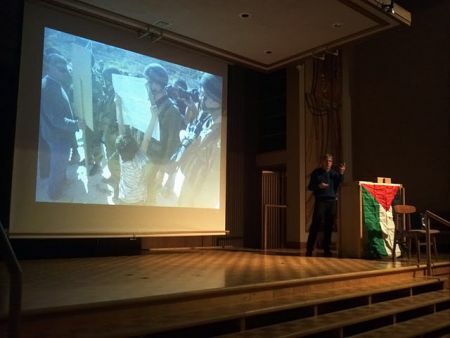 She screened a video of the capture of the Tahrir by Israeli occupation forces, relaying her own experience as the ship was attacked and boarded by the Israeli military in international waters before reaching Gaza. DeVito compared her experience in Israeli detention with that of Palestinian prisoners, emphasizing that over 4 out of every 10 Palestinian men have been imprisoned and that Palestinians are regularly abducted and held for months or years without charge under arbitrary administrative detention - and that when they are charged, they are brought before military courts with a 94% conviction rate. She emphasized the complicity of Canada and the United States with Israeli crimes, including the use of drones and mass political imprisonment, as well as the siege on Gaza and the apartheid wall. "It's Israel on one side, aided and abetted by the U.S. and Canada, and the rest of the world is on the other side. Do we want to be closely associated with Israel and the U.S., two countries engaged in perpetual war?" DeVito asked. 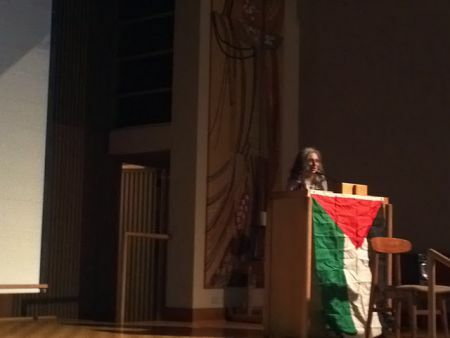 She urged the audience to get involved locally, saying that "not everyone can go for a month to sail to Gaza on a boat, but you can get involved with a group here - our group, the Boycott Israeli Apartheid Campaign, Canada Palestine Association, Independent Jewish Voices, CanPalNet, and others." The event closed with a plea for support for Palestinian refugees from Iraq coming to Canada, as well as discussion about the complicity of the corporate media and CBC in distorting the public image of Palestine.